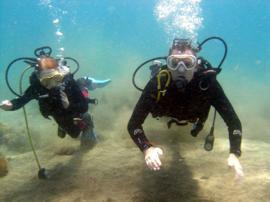 Try Diving in Gran Canaria -no experience needed! Yes, you can do it! You can swim underwater in the safety of the El Cabrón Marine Reserve and see loads of colourful fish! In just one day you will learn how to enter the sea wearing scuba equipment for your first open water dive, under the watchful eye of your PADI Professional instructor. You do not need any previous experience for this 'try-dive' yet you get to swim with hundreds of fish of all shapes, sizes and colours, and get to explore a small corner of the amazing El Cabrón marine reserve. You get a complete service to make a complete experience, from being collected in the morning from your hotel, the extended briefing in our private garden that we do before you go in the water, and then the personal attention that our experienced instructors give you in the water to keep you safe and show you all sorts of hidden animals and underwater secrets. The Arinaga area is famous for the quantity of colourful marine life that can be seen just a few steps from the shore, which makes it a popular destination for beginners dives. Only when you do a try-dive with Davy Jones Diving will you experience one of the most spectacular underwater areas, the Playa del Cabrón, where you can see strange creatures such as cuttlefish, trumpetfish, painted combers and if you are lucky in winter, angel sharks sleeping in the sand! What do you need for this experience? You do not need any previous diving experience to take your first try-dive. It helps if you are a confident swimmer, but don't worry if you are not a strong swimmer as your instructor can still guide you around the reef, and the equipment will make you float safely at the surface. You must pass a medical self-certification, and be over ten years of age. We collect you for your underwater excursion at around 9.00am from any Hotel in the main tourist resorts, and return you to your hotel in mid-afternoon. All transfers and equipment are included in the price, you just need to bring a swimming costume, a towel, and plenty of enthusiasm! You will hear how Scuba Diving as a recreational sport has developed and matured in the 60 years since Jacques Cousteau invented the Aqualung in the 1950's. You will see how todays equipment is well engineered, reliable and comfortable, and learn a little bit about the marine life you will encounter during your dive. What happens in the water? After you have been prepared for your try-dive, with your own suit, boots, mask and fins, we take you the short drive to the Playa del Cabrón, where we do the dive. Playa del Cabrón is one of Gran Canaria's hidden secrets .. an undeveloped beach at the end of a track, well known to the locals which is well protected from the northerly winds, and has an amazing natural underwater fauna and flora. Your first step in the underwater world will be to practice using your equipment to breathe underwater while still standing on the bottom. After you have learnt a couple more simple skills we start swimming on the surface, looking down at gold-striped bream, small pufferfish, wrasse and damselfish. When we think you are ready we then slowly let the air out of your jacket, so that you have the sensation of gently floating down towards the sea grasses. There are a maximum of just two students with each of our professional divers, and as you build up your confidence in the water we then take you for a guided underwater tour of the marine reserve! You get about forty minutes in the water, and all the time you will be looked after. You will experience the sensations of swimming freely underwater, and be able to enjoy the variety of the marine life, the colours and some of the peculiarities of the underwater world. What will you do and see on your Daycourse? Your excursion covers all basic knowledge and skills required to dive safely in the sea under the direct control of an instructor, including breathing, mask clearing, regulator clearing, and ear equalisation. You will also learn a little about how the pressure on our bodies changes as we go deeper, and how modern scuba diving equipment compensates for these changes. Just as important is that you will learn a bit about the underwater environment, and about some of the different marine creatures that can be found there. You will normally see three or four different habitats - rocky slopes, sand, sea grass, walls and open water, and each of these has it's own species and places to look. Your experience in the sea will last around 35-40 minutes - one of the longest beginner excursions in Gran Canaria. What other students said ..
5 stars - "Excellent day diving"
An excellent experience from start to finish. I was extremely nervous and totally panicked when I got into the water and said I could not go ahead. My fiancé carried on with his dive and had a wonderful experience. I stayed in the water and was reassured by a young man whose name I could not remember. He made me feel at ease and enabled me to calm my nerves and progress with the diving. I was not made to feel silly at all. We will never forget this experience. All of the staff are very professional. I have just had an amazing time! I panicked and didn't want to get in! but the instructor was wonderful - so calm and just helped me under and away we went. About 4 times I went into 'panic' mode and forgot to breathe, got water in my mask and generally went round in circles! But each time he was brilliant!! Thank you so much for a wonderful experience 'I will be back!' Sam & Tash PS my daughter really enjoyed it too! We had a brilliant time. We were informed before we went in the water in an excellent fashion and we would recommend this diving school to anyone who wants to have a truly excellent first dive. The instructors are that good, that when I tried to swim away from them they still managed to catch me. Awesome experience, one I shall definately be repeating. I also want to thank the instructors for all their time and effort. They are superb in all aspects and made our Adventure one my brother and I will never forget. Thank you very much. Fantastic experience. Can't wait to do it again. Thank you all for your patience. Your support, instruction and encouragement made this a brilliant day - Again thank you. If I like it my Discover Scuba Dive, Can I do more? You can certainly do some more diving! if you do not want to get a qualification, then you can do a 'double bubble' which is another similar dive, probably at a different dive site, without listening to the briefing again; or you can take either the PADI Scuba Diver upgrade in one day or the PADI Open Water course upgrade in 3 days, and gain a full diving qualification. Your daycourse can be credited as part of one of our other training courses, both for the content and for the fees paid. Safety is part of our culture, and is part of everything we do. By assessing all the risks carefully we have planned safety into each step. For this experience for beginners there are many aspects to keeping you safe, from the equipment we use, through the low ratios of instructor to students, to the use of a very safe area for the diving which has plenty of marine life to thrill any beginner. Over the last twelve years over four thousand people have safely taken this course with us. If you have any concerns about safety then please do not hesitate to voice them, and we will be delighted to explain how we keep our accident rate so minimal. When diving in Spain, the laws require that every diver is covered by both suitable medical insurance and a type of 3rd party insurance called 'responsibilidad civil'. To guard against any potential problem, we have organised a specialist policy with a Spanish Insurer which guarantees to cover all medical and Spanish legal issues for every single Daycourse Student that we teach. So rest assured, you do not need to dig out that policy and check it word for word before you learn to dive .. we've already got you covered. How much will my Discover Scuba Dive cost? You can enjoying the thrill of scuba diving for the first time in Playa del Cabrón in the heart of the Marine Reserve at Arinaga for just €85.00 per person. This price includes all the equipment you will need, including a warm wetsuit, mandatory Spanish diving insurance, local taxes and collection from your resort, and you get to dive for 35-40 minutes. Reserve your place in Gran Canaria on a great Discover Scuba Experience ! To Start planning, or book your day of scuba diving now You can click on some of the dates shown below or fill in the Express course enquiry and reservation form or use the information on our contact page to email or call us to enquire about or reserve a place on your PADI Open Water course. Discover Scuba Experience- Wk 17 22-4-2019 27-4-2019 - Check availability now! Where else do you get all this on your Try-dive? You get forty minutes exploring the Playa del Cabrón (one of the best dive sites in Gran Canaria) under the watchful eyes of a PADI Professional Diver. Your Discover Scuba Dive includes all the diving equipment you need, and free drinks in 'Casa Limon' the PADI Five Star Diving centre in Gran Canaria with a Tripadviser Award for Excellence. You will be picked up at your hotel and returned with a big smile on your face! You are fully covered by our insurance for both responsibilidad civil and medical costs. Plan your beginners dive in Gran Canaria!